If you ask ten different people to give you advice on how to sharpen wood carving knives, you will likely get ten different responses. Here’s my very simple unscientific advice on sharpening. Hopefully, you have purchased a good knife with good steel. If not, look for a well-known brand. 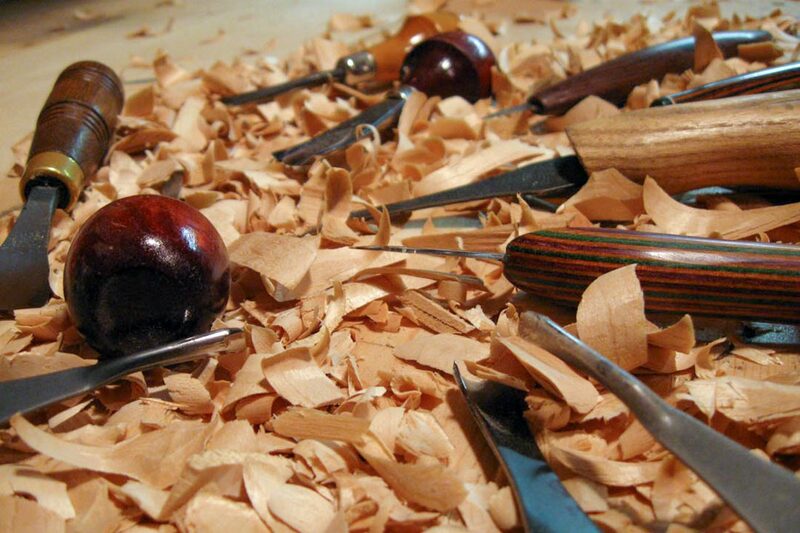 If you have any doubt about the quality, ask a wood carver or reputable knife dealer or do some research online. The knife doesn’t need to be very expensive. There are some quality knives available for around $10 (or even less) that will do a good job. But beware; some folks are out there to make a quick buck. 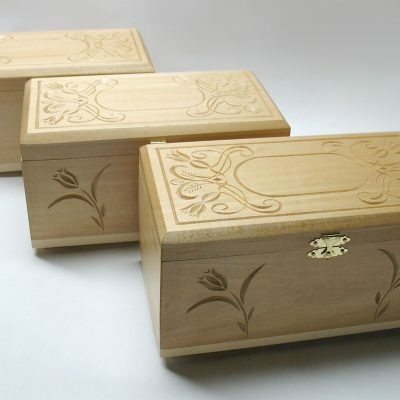 They realize that beginning wood carvers are enthusiastic about their newfound hobby and are eager to buy tools. Before you buy, especially tools that are expensive, do your research. Once you have a good knife, remember to be careful. You can slice yourself when sharpening your knife just as easily as when you’re carving. First, get some good sharpening stones. You should be able to find these at sporting and hunting supply stores, as well as many department stores. I like stones that are glued to a triangular piece of wood that you can hold in your hand. 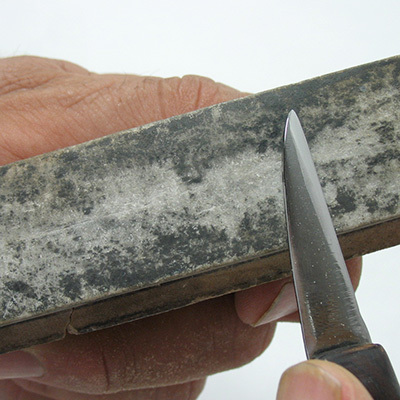 A different sharpening stone—medium, fine and ultra fine—is glued on each side of the triangular wood. You start sharpening on the medium side if the knife is very dull, then move to the fine side, and finish up on the ultra fine side. Lay the blade close to flat, but at a slight angle on the stone and push the knife away from you as if you were trying to slice off a very thin layer of the stone. Lay the blade close to flat, but at a slight angle on the stone and drag the knife toward you with the sharp side of the blade trailing. Lay the blade close to flat, but at a slight angle on the stone and make small circular motions with the blade. 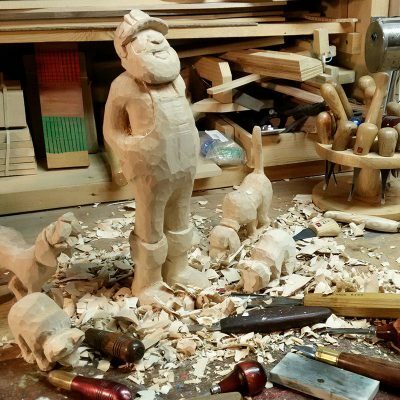 Most wood carvers I know recommend the first method. My advice is try all three and use whichever works best for you. After your knife is as sharp as you possibly can get it using one of the methods above, get out a leather strop. A strop can be purchased (you can pay big bucks for one if you want), but you can easily make one. Here’s how I made mine. You can change the dimensions to suit your needs. 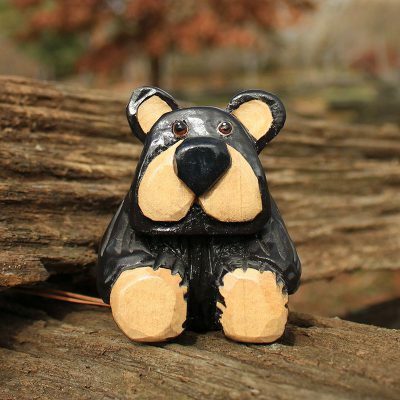 Find a piece of wood, approximately 1 1/2″ wide, 3/4″ thick, and 16″ long. Leave 11 inches as is and carve a rounded handle with the other 5 inches. I put a handle on one end of mine but you might rather have a handle on both ends. Get a piece of leather 1 1/2″ x 11″ from a shoe repair shop or a leather craft shop. Glue it to the wood. You can also glue an old leather belt of the appropriate size, finished side down to the wood. I used 5-Minute, 2-Part Liquid Epoxy. It’s the kind that comes in a double barrel plastic tube that looks sort of like a big hypodermic needle without the needle. You can buy it at any department store. Now get some sharpening compound. I have tried several kinds and like Herb’s Yellowstone. It comes in a solid block 4″ long x 1″ x 1″ and is packed in a little cardboard box. It’s consistency is similar to chalk. Scrape some of the powder off with the back side of your knife and let it fall onto your leather strop. Coat the leather. (It doesn’t take much.) After you use it once the powder will get embedded into the leather and should last through several stroppings. You don’t have to put it on every time. Strop your knife by laying it as flat as you can on the leather and, while holding a downward pressure on the knife, draw the knife toward you with the sharp edge trailing away from you. If you are using Yellowstone, your strop will turn black very quickly as you work your knife on it. This is the metal that is being cut from the knife, letting you know that the strop and the Yellowstone are doing their job. Your knife will be razor sharp and ready to use with just a little effort. When your blade shows any sign of losing its sharpness, strop it again. Don’t wait until it becomes dull. Strop it often, and you will seldom—if ever—use the stones again. I didn’t go into the degree of the angle to hold the blade and all that technical stuff. I don’t know many people who are so machinelike that they could hold a knife at a constant angle throughout a sharpening session. If you follow these simple guidelines, use common sense, and do a little experimenting on your own, you will find a happy medium for the angle that works best for you. You should get good results. And now you know how to sharpen wood carving knives. Keep the blade of the knife protected by putting it in a case or toolbox where it won’t bump up against any of your other tools, or it will be dull the next time you need to use it. If you have any questions about where to find any of the above-mentioned materials or any other questions, post them in the comments section below. I will be glad to help in any way I can. If you like this article and think others would find it beneficial, please share it using the share buttons on this page. Happy carving! Thanks for the information. I just started wood carving after I retired and have always had trouble keeping my knives sharp. I have a strop and compound. I also have the stones. I’m just lacking in skill.